In this post, we are going to studying how the LCD monitors or display will work and what type of technologies are used to build LCD displays. A Liquid crystal display is a passive device, which means it doesn’t produce any light to display characters, images, video and animations. But it simply alters the light travelling through it. The internal construction of LCD describes how the light altered when it passes through it in order to produce any characters, images, etc. Consider a single pixel area in LCD, in which there are two polarization filters oriented at 90 degree angle to each other as shown in figure 1.1. 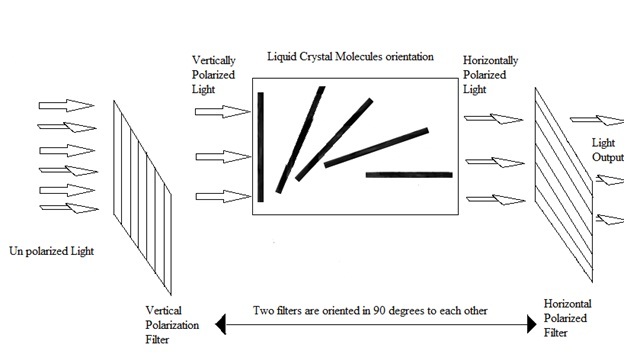 These filters are used to polarize the unpolarized light. The first filter (Vertical polarized filter in figure 1.1) polarizes the light with one polarization plane (Vertical). 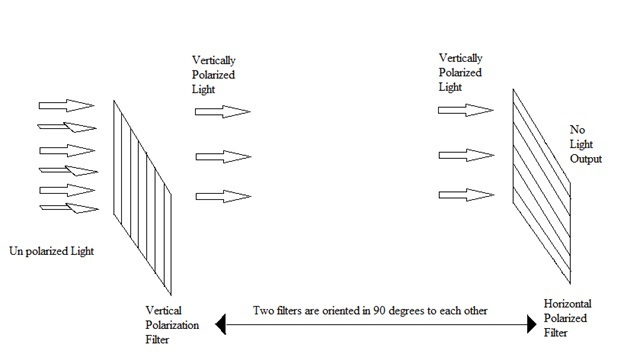 When the vertically polarized light passes through the second filter (Horizontal polarized filter) no light output will produce. The vertically polarized light should rotate 90 degrees in order to pass through the horizontal polarized light. This can be achieving by embedding liquid crystal layer between two polarization filters. The liquid crystal layer consists of rod shaped tiny molecules and ordering of these molecules creates directional orientation property. These molecules in the liquid crystal are twisted 90 degrees as shown in the figure 1.2. The vertically polarized light passes through rotation of the molecules and twisted to 90 degrees. When the orientation of light matches with the outer polarization filter light will pass it and brightens the screen. Figure 1.2 Liquid Crystal molecules orientation. If the Liquid crystal molecules are twisted 90 degrees more precisely, then more light will pass through it. 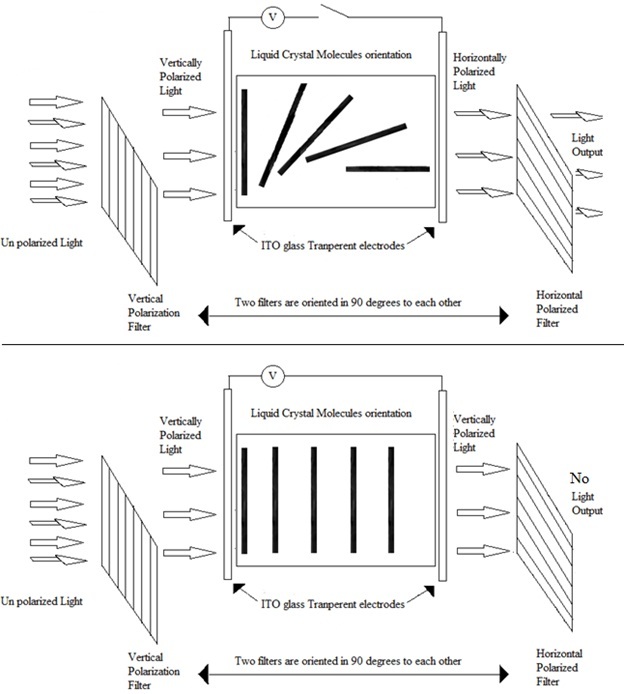 Two glass transparent electrodes are aligned front and back of the liquid crystal in order to change the orientation of the crystal molecules by applying voltage between them as shown in figure 1.3 and figure 1.4. If there is no voltage applied between the electrodes, the orientation of molecules will remain twist at 90 degrees and the light passes through the outer polarization filter thus pixel appears as complete white. If the voltage is applied large enough the molecules in the liquid crystal layer changes its orientation (untwist) so that light orientation also changes and then blocked by the outer polarization filter thus the pixel appears black. In this way, black and white images or characters are produced. 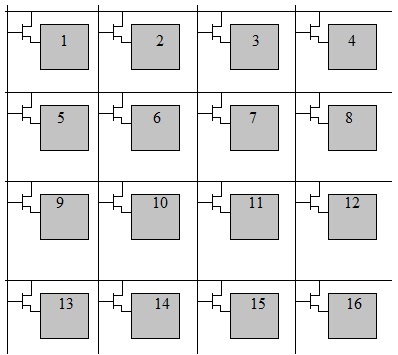 By arranging small pixels together as a matrix will produce on which it is possible to show different sizes of images and characters. By controlling the voltage applied between liquid crystal layers in each pixel, light can be allowed to pass through outer polarization filter in various amounts, so that it can possible to produce different gray levels on the LCD screen. Generally the electrodes is made up of Indium Tin Oxide (ITO) which is transparent material, hence it is simply called glass electrodes plates. LCD display is also “twisted nematic LCD” because of twist and untwist of molecules in liquid crystal layer. 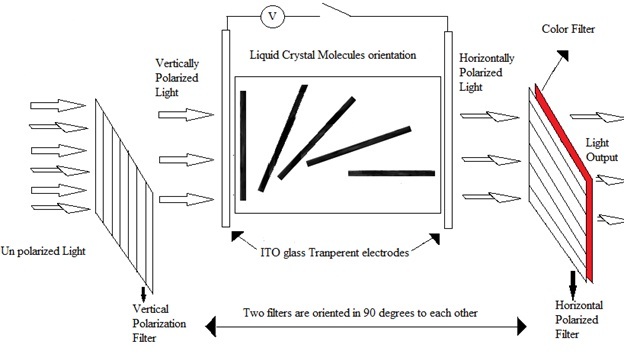 Figure 1.3 Orientation of Liquid crystal molecules altered by applying voltage between two ITO glass plates. In order to produce color images a color filter is placed in front of the outer polarization plate as shown in figure1.5. The red, green and blue are the three standard colors filters are placed for every three pixels to produce different color images by varying the intensity of each color. Figure 1.5 Placement of color filter in front of the polarized filter to produced color images. Based on the technology implementation LCD is classified into two types. 1. Passive LCD’s -- These LCD’s doesn’t produce any light to turn on or off desired pixels to produce the characters or images. It uses a grid of conducting material to activate each pixel. · Slow response time due to that it doesn’t produce colors exactly. · Poor contrast so that ghost images will appear. b. Super Twist Nematic (STN). c. Film Compensated Super Twist Nematic (FSTN). d. Color Super Twist Nematic (CSTN). 2. Active LCD’s -- These displays are similar to passive, but an active device (transistor) and a capacitor is connected to each pixel to control the voltage precisely. The capacitor for each pixel holds the charge for complete refresh cycle. · Faster pixel response rate than Passive matrix displays thus stunning images will be produced. · Higher contrast, higher resolution so that shaper display output. · This display’s comes with better viewing angle than passive matrix display. · These displays are highly expensive than passive matrix displays, because each pixel require a transistor and capacitor pair. · More complex hardware is required. a. Thin Film Transistor (TFT). b. Thin Film diode (TFD). Twisted Nematic (TN) display – In these types of LCD displays the molecules in the liquid crystal layer is twisted by 90 degrees to alter the light passing through the pixel. Super Twisted Nematic (STN) display – 180 to 270 degrees twist of molecules, so that more contrast will be achieved in displays than Twisted Nematic technology. These types of LCDs are used in old mobile phones. These types of LCD suffer with lower image quality and slower response time than TFT, because of that blurring of characters or images are occurred. Double layer STN (DSTN), Monochrome STN (MSTN) and Fast Response STN (FRSTN) is also use the same STN technology with minor variations. Film Compensated Super Twisted Nematic (FSTN) – To achieve more sharpness and better contrast, it uses a film compensation layer between STN display and outer polarized filter. Double Film Super Twist Nematic (FFSTN) display is advanced than FSTN to achieve more contrast. Color Super Twist Nematic (CSTN) – These displays uses red, green and blue color filters to produce color filters. Thin film transistor (TFT-LCD) – This type of display uses a thin film transistor for every pixel in the screen as shown in the figure 1.6. These transistors are responsible to produce sharper images by varying voltage applied to it and the cafspacitors are used to keep constant voltage to activate pixel over the entire refresh cycle. TFT LCD’s are used in Television sets, Laptops, Mobile phones, etc. Based on the type of information displayed, the LCD’s are classified into three types. The LCD displays will display all alpha numeric values with some special characters including currencies symbols of different countries. 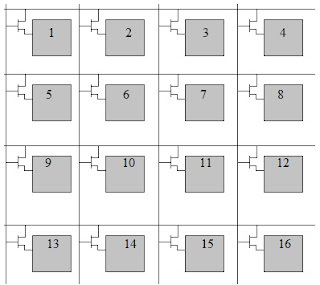 These displays are mainly used in calculators, remote controllers, and display panels, etc. These displays are not capable to produce any graphic animations or images. These LCD displays are capable to produce any monochrome graphical images and animations by energizing set of pixels in the LCD display. These are also capable to produce characters, numbers and special symbols. These LCD displays contains three sub pixels with primary colors Red, Green and Blue. Each color sub pixel can produce a range of 256 shades by varying the voltage applied. Therefore Red, Green and Blue can produce 16.77million (256*256*256) colors. These color displays require more number of transistors for its construction. Ex: Generally the laptops contain these color LCD displays with maximum resolution 1,024x768. general home personal computers got demand due to LCD monitor usage. Best information on LCD. Visit Led Video Screen For Sale which offers the best collection of led display at a fair price.